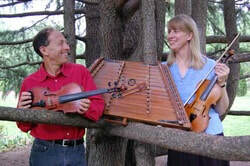 Ken Kolodner (hammered dulcimer, fiddle, hammered mbira) and National Scottish Fiddle Champion Elke Baker’s (fiddle, viola) approach to traditional music reflects both a deep respect for the tradition and a healthy spirit of creativity, as they effortlessly combine tremendous precision and musicality with a mastery of the improvisational freedom essential to traditional music. After collaborating for many years in performance, including guest recording on each other’s CDs, Elke and Ken celebrate the completion of their first duo release Out of the Wood. Hailing from the Baltimore area, National Scottish Fiddle Champion Elke Baker (fiddle and viola) and Ken Kolodner (hammered dulcimer, hammered mbira and fiddle) are widely known as masters of their instruments. Between them, they have recorded over 20 CDs and toured in every state in the U.S. and well-beyond. Called a "local treasure," (FSGW) Elke Baker's playing has been said to be a "rare delight," with "precise technical skill, and fulness of soul" (Celtic Beat) and capable "to make hearts bleed" (The Frederick News) while Ken’s playing has been described as “world class” (Sing Out! ), "nothing short of astonishing" (The Connection), “outstanding” (The New York Times), “marvelous” (The Washington Post), “virtuosic” (Audio), “stunning in its musicality” (Dulcimer Player News) and “not to be missed” (USA TODAY). Elke and Ken perform a rich variety of Scottish, Quebecois and Irish music, original compositions, and refreshing, foot-stomping Old Time twin fiddling that'll bring the house down.